HTC recently announced 5 new smartphones – the Wildfire S, Desire S, Incredible S, ChaCha and Salsa at the Mobile World Congress 2011 in Barcelona. All these smartphones runs on the latest Android 2.4 (Gingerbread) operating system. If you are currently using the HTC Desire, Desire HD or Desire Z, then we have a good news for you. An HTC representative recently told CNET UK journos that, the HTC Desire, Desire HD and Desire Z, which currently runs on the Android 2.2 (FroYo) operating system, will definitely get the Android 2.3 (Gingerbread) update, later this year. According to him, the Desire family will get the Gingerbread update, two months after the release of new member of the Desire family, the Desire S.
HTC Desire S is likely to be released in May or June, so the Android Gingerbread for the Desire family will be available only during the Q3 of 2011. According to the representative, Desire HD and Desire Z will first get the Android Gingerbread update, followed by the original Desire smartphone. 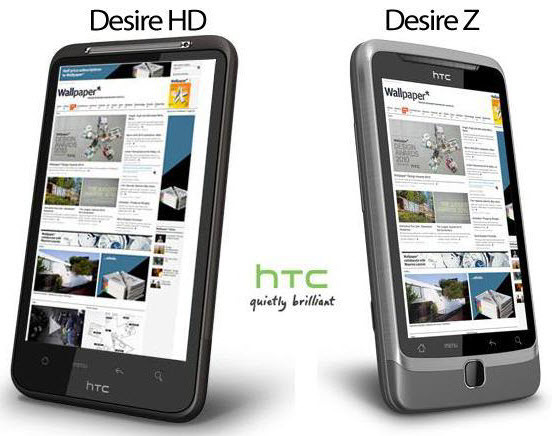 This is definitely a good news for the Desire, Desire HD and Desire Z owners. However, there is no words regarding the availability of Gingerbread on Nexus S smartphones.